Maybe Gritty has all fired up (all Flyered Up)? Either way, according to Gas Buddy, Philadelphia has the 2nd Most Aggressive Drivers of any City, just behind Los Angeles. Anyone who has ever driven the Schuylkill on a Friday afternoon in June will be unsurprised to hear that Philadelphians tend to do a lot of fast starts and hard brakes during their daily commutes. Here in the Northeast, we have a lot of old routes and roads, some of which started out as wagon trails over 180 years ago in the days of westward expansion. In the the last 50 years, our suburbs have exploded with subdivisions and “bedroom communities,” but we have not done much in the way of roadway expansion. Think about it. You only began driving on the Blue Route in the early 90s after the project sat stalled for over 20 years. 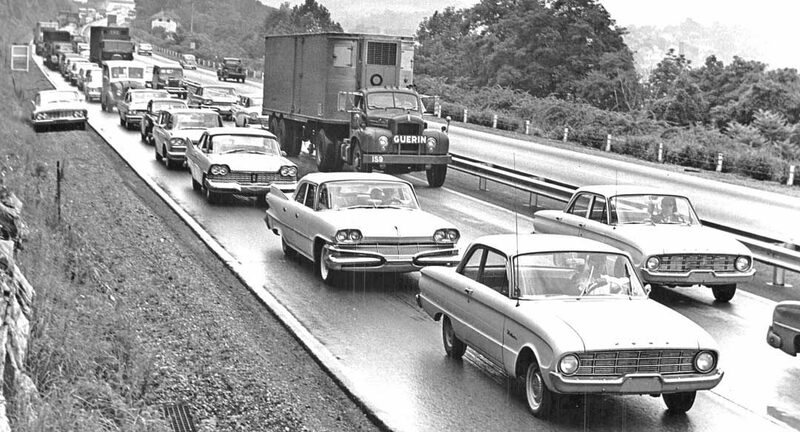 When a new section of the Schuylkill opened in 1954 and literally had standstill traffic on Day 1. In short, if you drive aggressively, maybe grandpa did too over six decades ago. But, excuses aren’t doing any of us any favors. That guy cut me off, I’m running late and But, grandpa did it aren’t going to cut it with Tredyffrin PD when they pull you over for aggressive driving on 30 during the morning rush. As such, we implore everyone out there to please take it easy and budget a little extra time and patience into your commute and leave the chaos to Gritty.